offer must be redeemed at estimate. Does steam cleaning damage grout? In this photo you can see the pits and holes in the grout created by the high-pressure steam cleaning of the tile and grout. Yes, the grout is clean but it is now far more rough and porous. Soil will now find it’s way into the pits and will stick in the newly created depressions. Even if a high quality grout sealer is used the grout will be more porous after the grout steam cleaning company has left than it was before they arrived. In most cases the same grout cleaning company that takes the short cut of steam cleaning will also try to increase profits by using an inexpensive low quality sealer. Additionally, they feel it will give them an opportunity to return on a yearly basis to clean your grout again. A proper sealer should last 5 to 7 years. Avoiding damage to grout is the reason Seal Systems tilesealing.com does all grout cleaning by hand. 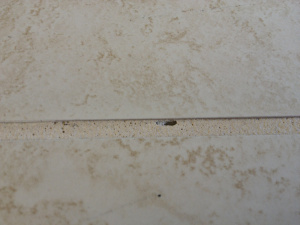 If time permits visit tilesealing.com/grout-cleaning to read about proper grout cleaning procedures.